What could be more quintessentially British than Fish and Chips? Well folks, get ready for some fried food because several London restaurants are offering gluten free batter and dedicated friers on certain days of the week. And do try the mushy peas. 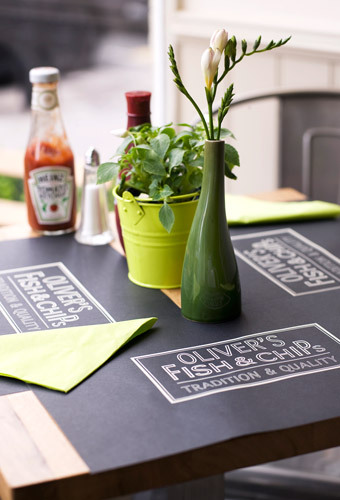 Oliver's is a great fish and chip shop, serving classic food but in modern environment with class. I love this place. They do gluten free fish and chips every Wednesday - so be sure to put it in your diary. Looking for gluten free fish and chips in other parts of the UK? This guidebook to the best UK chippies shows which ones have gluten free! Do they still have fish and chips though? Thanks a ton for sharing. It makes travelling a bit easier. Now I'm off to go find these fish and chips! Also, yesterday I visited a Leon's, where I had grilled salmon and baked chips. It's not exactly the same experience, but it's better than my first trip to London in 2009 where I ate salad everyday! Great blog! Last week in London for a holiday. Last wednesday visited Oliver. Great! Very tasty and good service! I was at "grill on the square" and they have GF fish and chips. They also make the chips is separate fritter, so you can have steak with it. The waiter was very well informed and really nice. Yes the grill on the square does still have gluten free fish and chips - HOWEVER - they are running a gluten free menu that is NOT correct - they have many items marked as gluten free which are NOT! Therefore I don't recommend it unless you only stick to the fish and chips until they have this problem resolved.